With the inundation of hilarious cat videos on the Web, we can’t help but have a soft spot for the feline variety – which is why we aren’t questioning Catsino pokies by Rival Gaming. Featuring high roller cats in a casino, bright graphics definitely jump off the screen. Whether or not the features are worth your real money wagers is another question, which we are here to answer. 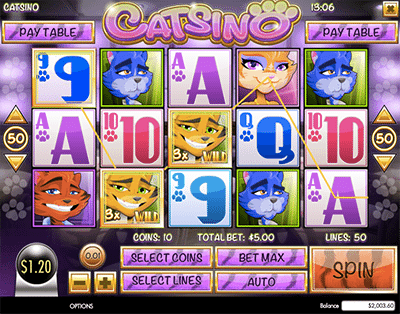 Catsino features 5 reels and a huge 50 paylines with just four coin sizes to choose from. You can have as little as one payline activated and as many as the entire 50 – recommended for the best payouts. There’s also 10 coins available to play, but the more coins the better the payouts. When the title is first opened an introductory video featuring stereotypical casino players – such as the mafia, females on the pokies, suave guys on the tables, and more – all represented by cats. This is quite comical and worth watching if you are a fan of the feline kind. There’s an old school jazz soundtrack accompanying the reels which can put you in the mood for gaming, but if you prefer silence you can mute it via the options button. You can also change the graphical resolution if you’re Internet connection is a bit slow. While the feline themed pokie is filled with kitty cats, there’s also the inclusion of the 9, 10, J, Q, K, and A symbols which represent the lower payouts. These symbols have been redesigned to appear like cards with paw prints on them – which is quite fitting. The top payout for the lower paying symbols is 100 coins, won by spinning five A symbols. The middle value symbols are represented by the blue cat, the female cat on her phone, the red/orange cat, and the purple female cat with a drink, with the latter paying 500 coins when you spin five of a kind. The higher paying symbols are represented by the female orange cat, the blue chip with a paw print on it, and the stack of cash, with five cash symbols scoring you the top payout of 1250 coins. There’s two other symbols to keep an eye out for too. Wild: The Wild is represented by the male orange cat featuring the text ‘Wild’. It substitutes for every symbol and will see a multiplier applied on wins. During the base game the multiplier is 3x, during the Free Spins feature the multiplier is 5x and during the Nine Lives Super Round the multiplier is 7x. Scatter: The Scatter is the purple mafia looking cat and spinning at least three during the base game will trigger the Free Spins feature, while spinning three during the Free Spins feature will trigger the 9 Lives Super Round. There’s two bonus features to Catsino, though they’re quite similar. Free Spins: If you spin at least three Scatter symbols you will trigger the Free Spins feature. Here you are awarded with nine free spins and any wins completed by a Wild will see a 5x multiplier applied. The Nine Lives Super Round: If you manage to spin at least three more Scatter symbols during the Free Spins feature you will be awarded with Nine Super Rounds where you recieve another nine free spins and any Wild wins will see a 7x multiplier applied. It didn’t take long to trigger the free spins. However, while the Wild multiplier is quite generous, it isn’t guaranteed to complete a winning payline on every spin so it isn’t actually that great of a feature. Additionally, we didn’t win much when we triggered the free spins the first time unfortunately. After we triggered the free spins the first time, it was hard enough to trigger them again let alone trigger the Nine Live Super Round. But when we did we did win a fair amount. The 3x multiplier on Wild wins in the base game does somewhat make up for this too, as we did score some substantial wins. Overall, this pokie isn’t the best we’ve seen but if you are a feline fanatic and after some Wild multiplier wins you’ll enjoy this title by Rival Gaming. You can find Rival Gaming’s title at SlotsMillion.com, our number one recommended site for the biggest variety of pokies. There’s over 1100 available on desktop and over 500 available on mobile devices – including the smartphone and tablet version of Catsino.